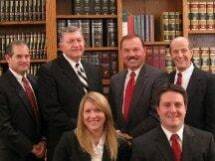 Our firm has four partners, two associate lawyers, and one of counsel attorney practicing in many areas including Business & Commercial Law, Employment Law, Real Estate, Estate Planning and Probate, Taxation, Transportation Law, Family Law, Creditor/Debtor - Bankruptcy, Litigation, Civil Litigation, and Appellate Work. We provide this site as a timesaving step to introduce you to our firm. Please feel free to contact us by telephone, facsimile, or email to obtain further information. Most initial consultations are free of charge. We welcome discussing and analyzing those legal matters that are troubling or confusing you. We are located in Golden Valley, Minnesota on the South frontage road of Olson Memorial Highway, just minutes from downtown Minneapolis. There is convenient major highway access to the on-site parking lot serving our one-story office building.